Restore damaged tresses to their former glory with the Grow Gorgeous Rescue & Repair Routine, for those who desire hair that’s smooth, nourished and strong. The Rescue & Repair Conditioner for damaged hair is formulated with a unique blend of Murumuru and Cupuassu Butters, Amino Acids, Sea Satin™, Keratrix™, Bamboo Extract and Vitamins B and E for deeply hydrated, strong and protected strands. 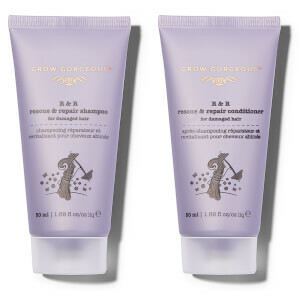 Use the Grow Gorgeous Use the Grow Gorgeous Rescue & Repair Conditioner with the Grow Gorgeous Rescue & Repair Shampoo to reinforce hair fibres, minimise breakage and intensely condition strands. Make weak, brittle hair a thing of the past. Repair, protect and strengthen hair damaged by bleaching and excessive heat styling. Reinforce hair fibres, increasing strength and elasticity so hair is resilient to breakage. Intensely nourish and condition dry, weak strands to leave hair hydrated, smooth and soft. * Keratrix™ is a trademark of Provital, S.A. I've been searching for a product for years (I mean years) to sort out my elasticy long tatty hair. This product makes me feel like I've just had a hair cut as the ends are strong and sleek looking. The bottle has lasted me a month so far and still about half left. This conditioner along with the shampoo really seems to be making a change to my hair texture and quality. I have noticed less breakage and split ends and have only been using it for 3 weeks. I also get a great result when using this before hair drying my hair as seems to make it sleeker and shiner. Fab product! Love this conditioner. I have been using it along with the shampoo for about a month now and I can definitely see a difference. My hair is so soft and smells amazing! I would definitely recommend especially if you use heat regularly! I've been using this conditioner alongside the shampoo and it definitely feels like it's making a long term difference, as well as making my hair soft as soon as it's been washed. Also, the smell stays with you for a few days after you've washed and the smell is AMAZING. I have been using the shampoo along with the conditioner for a couple of weeks and my hair feels and looks healthier. It's smoother, shinier and I am really happy with it. I will keep using it for longer to give it time to deliver full results. Used this in conjunction with the shampoo and my hair has honestly never looked better! I usually have to use a lot of conditioner once I have washed my hair, as curly hair can tend to be super dry and because of that, really frizzy. This routine has made my curls super defined, shiny and healthy and NOT frizzy, which always happens on wash day. Love this, buzzing to have finally found products which actually work on my hair, will definitely repurchase! I have really dry and coarse hair and after a few uses of the repair shampoo and conditioner, I have definitely noticed a big difference in the texture of my hair! Not to mention how lovely this product smells, I've had so many compliments!